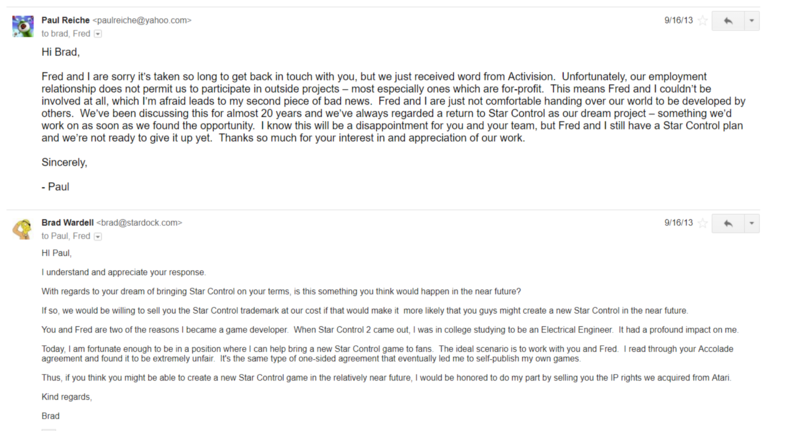 Reiche and Ford have not directly asked for Star Control: Origins to not be released. 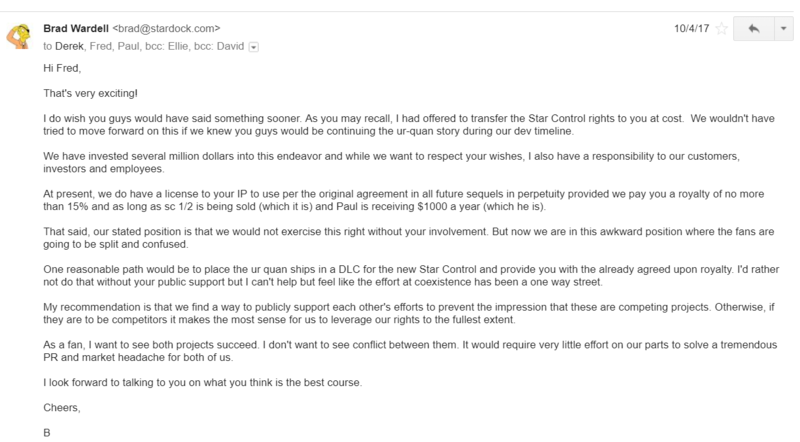 They have, however, asked for an injunction to stop Stardock from "all use of any creative material from Reiche and Ford’s Star Control Games in Star Control: Origins". (pgph 136a) This echoes their request in private settlement. (sec 5) If an injunction were issued it could cause developmental problems and delays for Origins depending on how deeply the infringing material is embedded in Origins and how much reworking would be required to remove it. 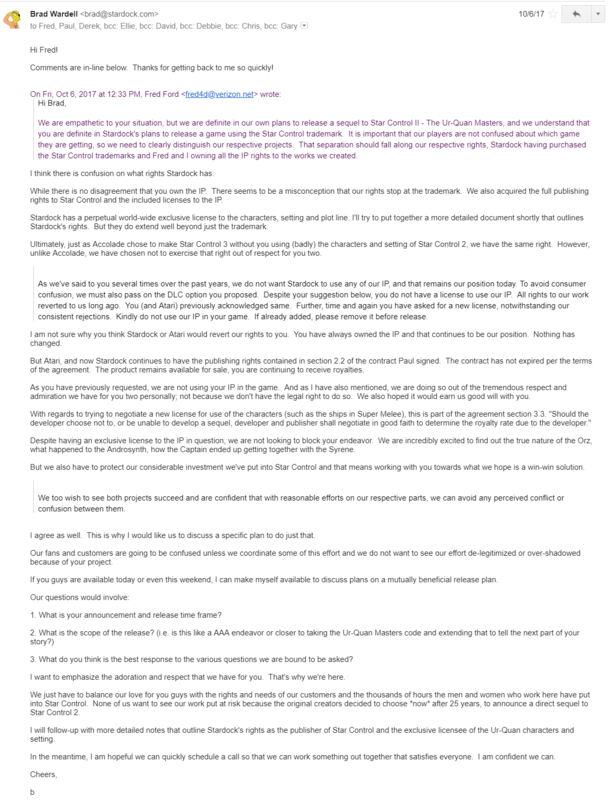 (16) - February 22, 2018 - ANSWER to Complaint with JURY DEMAND byRobert Frederick Ford, Paul Reiche III. 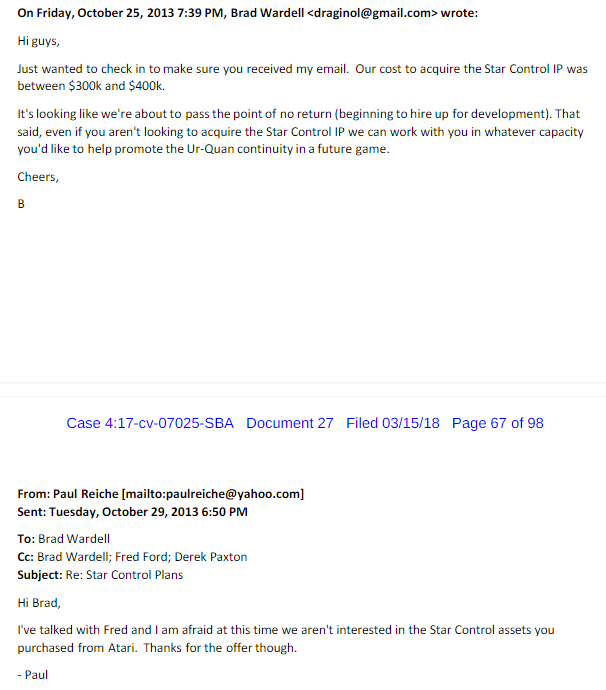 (17) - February 22, 2018 - COUNTERCLAIM against Stardock Systems, Inc.. 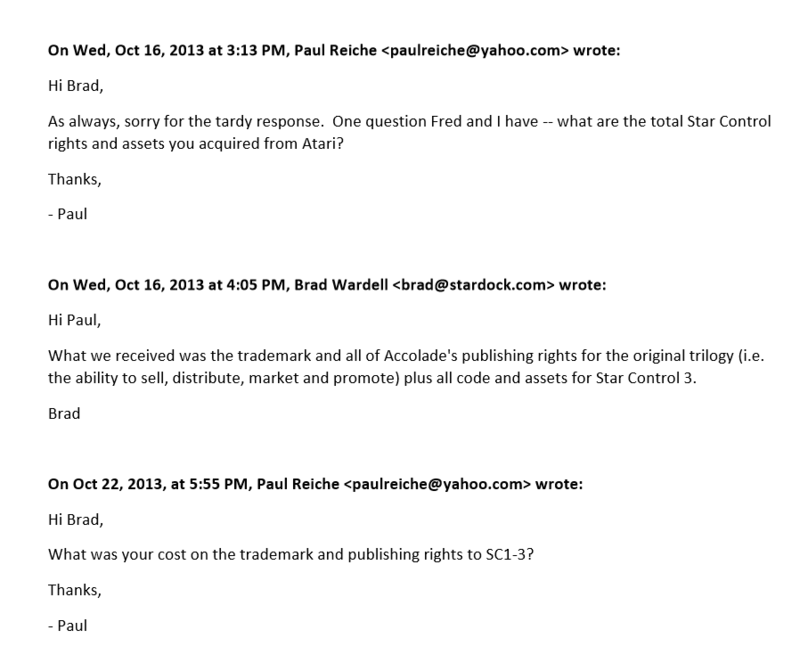 Filed byPaul Reiche III, Robert Frederick Ford. 2018-10-24: Trademark (Pub. Pending): "Fwiffo" - Stardock Systems Inc.
2018-10-24: Trademark (Pub. 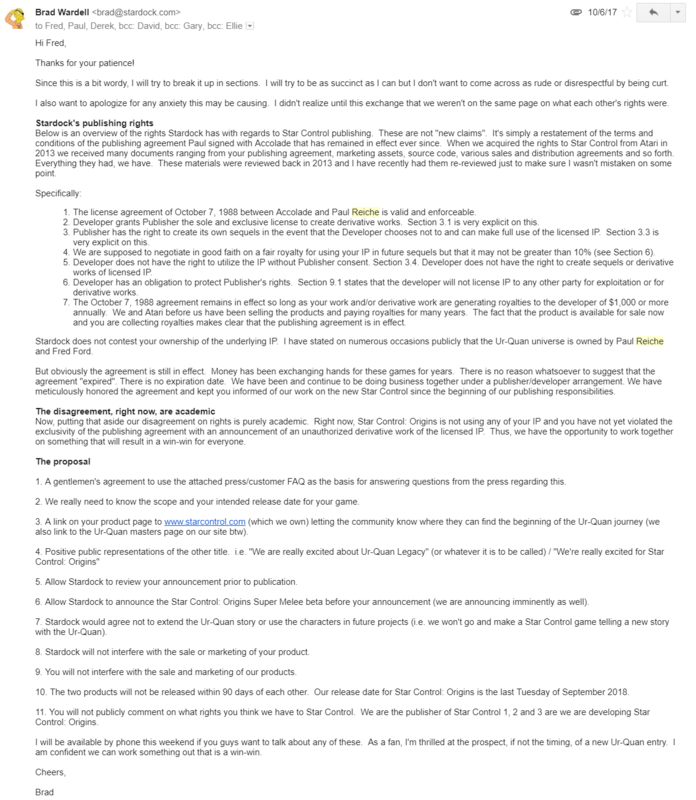 Pending): "Druuge" - Stardock Systems Inc.
2018-10-24: Trademark (Pub. Pending): "Chmmr" - Stardock Systems Inc.
2018-12-08: Trademark (Under Examination): "Orz" - Stardock Systems Inc.
2018-12-11: Trademark (Under Examination): "Melnorme" - Stardock Systems Inc.
2018-12-11: Trademark (Under Examination): "VUX" - Stardock Systems Inc.
2018-12-11: Trademark (Under Examination): "Yehat" - Stardock Systems Inc.
2018-12-11: Trademark (Under Examination): "Taalo" - Stardock Systems Inc.
2018-12-11: Trademark (Under Examination): "Dnyarri" - Stardock Systems Inc.
2018-12-12: Trademark (Under Examination): "Pkunk" - Stardock Systems Inc.
2018-12-12: Trademark (Under Examination): "Chenjesu" - Stardock Systems Inc.
2018-12-12: Trademark (Under Examination): "Spathi" - Stardock Systems Inc.
2018-12-12: Trademark (Under Examination): "Ur-Quan" - Stardock Systems Inc.
2018-12-13: Trademark (Under Examination): "Arilou" - Stardock Systems Inc.
2018-12-13: Trademark (Under Examination): "Ilwrath" - Stardock Systems Inc.
2018-12-13: Trademark (Under Examination): "Syreen" - Stardock Systems Inc.
2018-12-14: Trademark (Under Examination): "Androsynth" - Stardock Systems Inc.
2019-03-10: Trademark+Service Mark (Under Examination): "The Ur-Quan Masters" - Stardock Systems, Inc.
2019-04-12: Trademark (Under Examination): "Crimson Corporation" - Stardock Systems Inc. 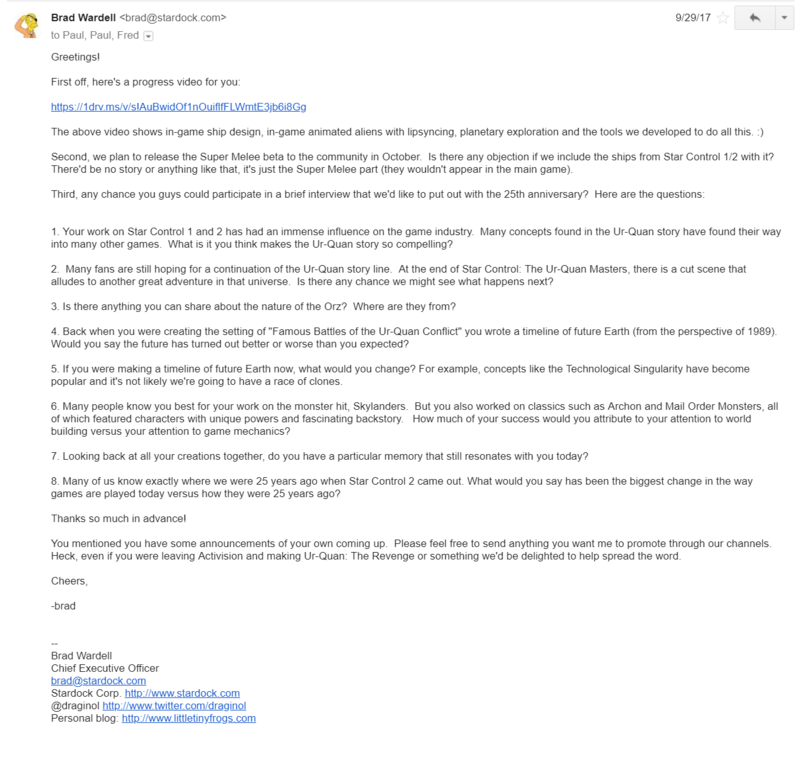 Suspended: Trademark (Suspended): "Precursors" - Paul Reiche III (Blocked by "Remnants of the Precursors", which is blocked by "Ghosts of the Precursors"). 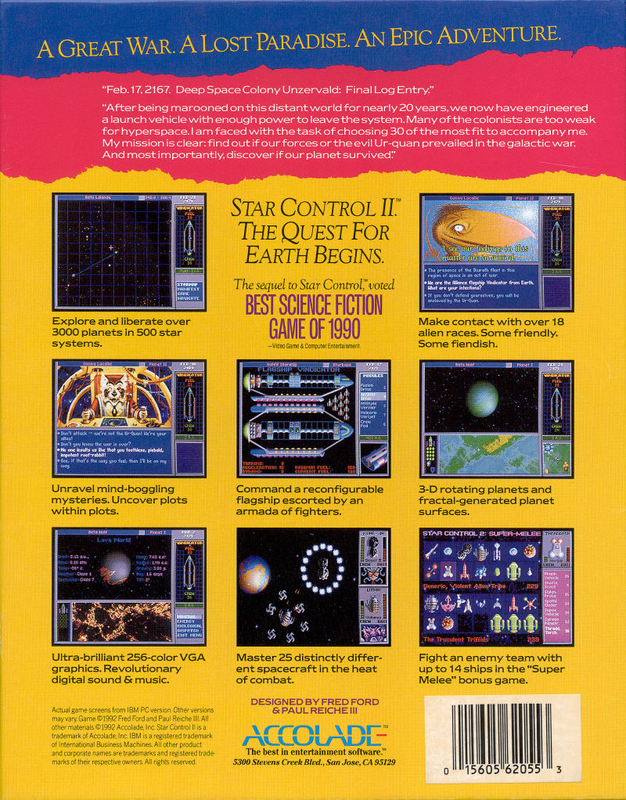 2026-03-18: Trademark (Registered): "Star Control" - Originally by Accolade, Inc. Last Owner: Stardock Systems, Inc.